Our facility is custom designed specifically for gymnastics, tumbling and trampoline activities. We continually upgrade and improve our custom built facility to benefit our students. Our facility is clean, with all the latest equipment. You can see all the action from our multiple viewing areas and video monitors..
Our friendly teachers have been carefully interviewed and selected based on their love of kids. Our teachers undergo continual training to provide a safe, organized, happy environment for all. Gymnastics classes start for children as young as 2 years old, and continue through the teen age years. 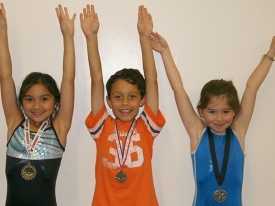 We offer gymnastics classes, tumbling classes, competitive gymnastics teams, and more. Our curriculum, developed over 35 years of experience is one of a kind! And last, but not least, We make learning FUN! We invite you to come visit us and see for yourself!